Celebrities Tattoos Gone Crazy : Everything About Fashion Today! Tattoos are beautiful for some people and usually you get them to make a statement to show your love for something or someone special. Celebrities of course, are human, and they are in the public eye also, so here I bring you some of the tattoos gone bad for one or another reason. Take a look and if you are thinking about getting a tattoo of your own make sure you don't make the same mistakes. Remember, they are forever... well, unless you want to go through the painful process if you want to get them removed. We think Name tattoos could go both ways, depending who's name you are going to imprint. Denise Richards was married to Charlie Sheen for a few years, but now she is left with a permanent reminder with his name "Charlie tattooed on her ankle. Ops! Make sure your tattoo artist can spell...! Hayden Panettiere's vertical back tattoo was intended to spell out "To live without regrets" in Italian, but unfortunately for her, the tattoo artist made a mistake and the tattoo is slightly misspelled with an extra "i" in "rimipianti" instead of the correct "rimpianti". Take a look at Heidi Klum's tattoo, it is beautiful but it is big. The unique calligraphy actually reads the name of her soon to be ex husband Seal and the initials of their children. I believe this is another oopss! Make sure you get a good tattoo artist. 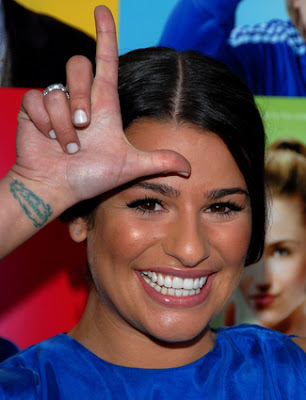 If you can see Lea Michele's tattoo, is a little sloppy and you can barely read what it says. It's supposed to say Believe to pay tribute to her big break after starring in the Broadway Musical "Spring Awakening"
Talk about tacky... this is the perfect example. Snooki has a tattoo of a crown, it is embellished with leopard print stars and zebra stripes. Seriously? Let's just say, we hope this bracelet never goes out of Style. Scarlett Johansson's tattoo reads I <3 NY.